The Kansas City Royals have announced their 2017 regular-season schedule. Opening day is scheduled for April 3 on the road against the Minnesota Twins. The Kansas City Royals home opener at Kauffman Stadium is April 10 against the Oakland Athletics. The Royals will play 26 series at home, with the majority of play against teams in the National League West. Some notable mentions for 2017: The Royals will face the Giants for the first time since falling to them in the 2014 World Series. Kansas City will play the St. Louis Cardinals in their usual I-70 series four game split. In addition, the Royals will play against the Dodgers at Chavez Raine in LA for the first time since 2003. 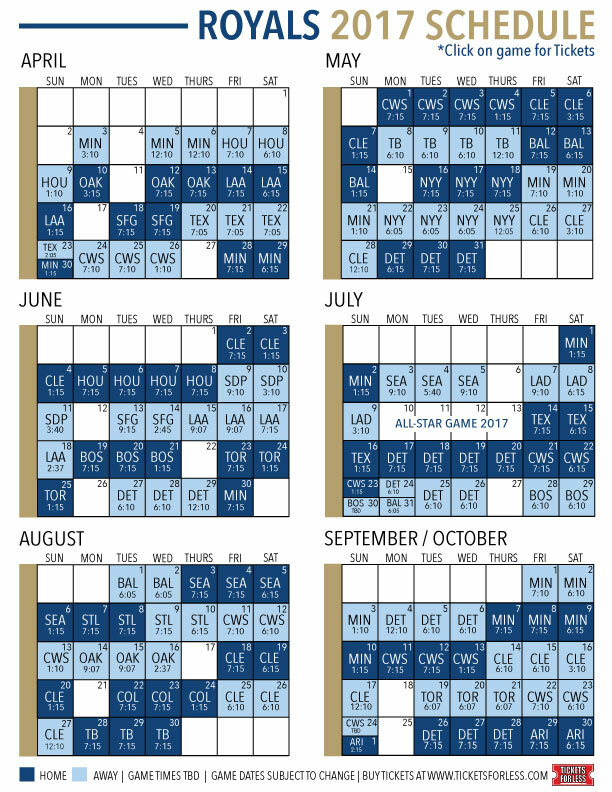 For the entire schedule, check out the Tickets For Less Royals 2017 Printable Schedule. *Remaining game times and promotions will be announced later.